Istanbul is one of those cities that grew fast and furious in the mid-twentieth century when so many municipalities were investing in truly dour architecture: the city is lousy with mid-rise concrete apartment blocks that are a grim ring around the vibrant and messy historic center. 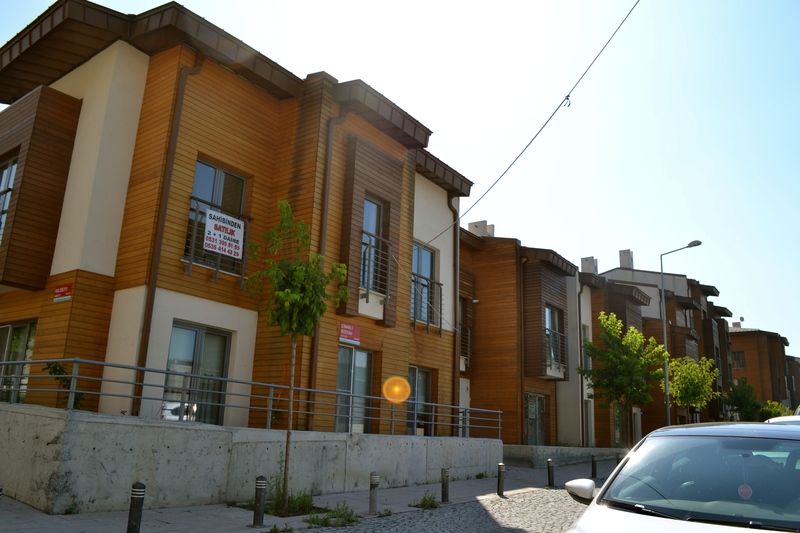 So it was refreshing to see this new development of contemporary housing based on Ottoman residential traditions. It’s a giant development up by the Theodosian walls, a bit west of the Chora Church (my destination when I ran across this new construction). They’re not “revivals” to be sure, but certainly recall the scale, proportions, materials, and massing of the timber houses that still stand in various places around the city (click here for more info on this interesting vernacular). I wonder if the architects also followed through with not just the old-looking shells, but also the way those older homes must have been planned, not just for daily domestic functioning (which would be interesting to see how that has changed since the time of the Ottomans), but also in terms of the way they manage local climate. Would love to know more about this project, and would really love to see more of this kind of smart and humane (and potentially more sustainable) development–and not just in Turkey. If I have learned one thing through prep for the trip to Turkey, the actual travel there, and my beginning reflections on the experience, is how inadequate my understanding of the region’s history is. Most of what I know about Turkey–and I suspect this is true of many people educated in the US–is those parts of the story that conveniently rub up against the grand Western narrative. 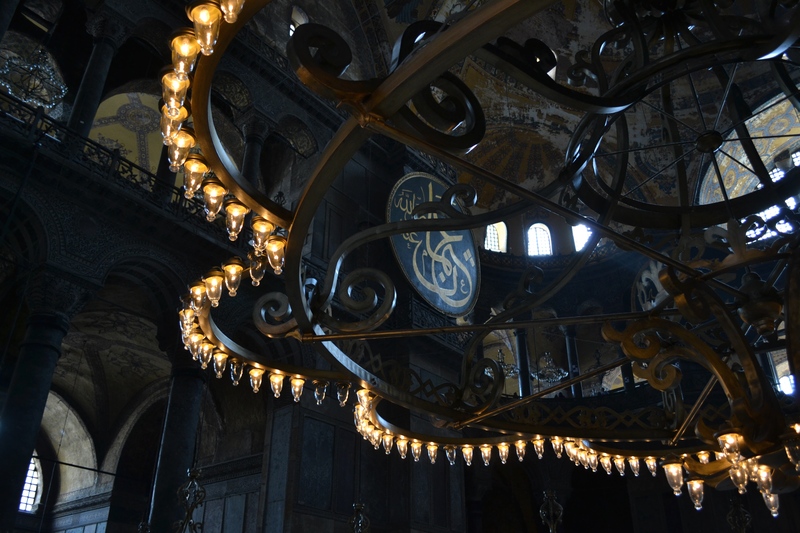 Even so, the great mosques of the Ottoman Empire present a particular problem for architectural historians, since they don’t fit super-neatly into that narrative and require a detour of sorts–although that detour is eased by the association of the Sinan tradition with Justinian’s great cathedral, Hagia Sophia. But even that link is wobbly, since there is little sense of what was going on, architecturally, with the spread of Islam before that time–at least through a majority of texts (aside from those that, more or less elegantly, squeeze those early hypostyle plans into the story). So it was important, and helpful, to first study the Ottoman mosques before the Conquest of 1453, and better yet, to be able to walk in and around these great buildings that non-specialist architectural history has forgotten (or just ignored). 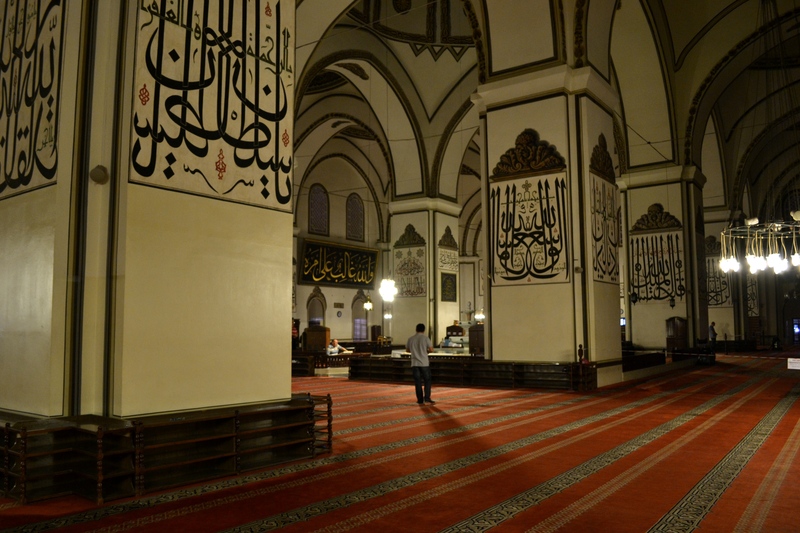 On our way back to the hotel from dinner one night we stopped in at the Bursa Grand Mosque (Ulu Cami), finished just before the year 1400. It’s a massive hulking thing, with huge piers supporting twenty domes of equal dimension. Its connection to the even earlier Seljuk tradition became apparent later in our travels. But also it was not hard, in this dim and heavy place, to really understand what it must have been like for the conquerors of Constantinople to come upon Hagia Sophia and see a whole new opportunity for architectural grandeur that is clearly affecting to a broad portion of humanity, regardless of creed, nationality, or chronology, for that matter. Today my group was taken on a big, intense, bordering-on grueling march through three od Istanbul’s greatest hits: the Topkapi Palace, Blue Mosque, and Hagia Sophia. Any one of them could (and probably should) command at least several hours; to do them ( and lunch, and the Basilica Cistern, just for good measure) in one day, during summer tourist season, is ambitious, to say the least. We were somewhat rushed, as you might imagine; further, I had been most eager for one of the sites in which our time was particularly compressed. This is the great Byzantine church, and later Ottoman mosque, Hagia Sophia. Our guide took us through the building and kept to her script, allowing us only 15 minutes to explore on our own. This was a little vexing, since I was so looking forward to time in this amazing building that I only knew through the drawings and photos that I show my sophomore class every year. What saved the day was my foresight, a few weeks ago, to download some Byzantine liturgical music, so I plugged in and spent my 10 minutes not madly taking pictures, but taking in the church. The music had a near-magical effect; the noise of the crowds was drowned out, and all the other people actually seemed to slow down and sort of fade away, like I was gifted with Matrix-like powers of perception. It was really quite moving, to see the building with something like the soundtrack it was designed to house. Impressive how digital media and earbuds enlivened and enriched the best 10 minutes I could have spent in that sixth-century cathedral.